Some months ago, my husband joined a men’s study group at our church, a group I refer to affectionately as the “Boys Only Book Club.” Each month the “boys” read a book on Christian living or theology and then meet to discuss it. Their last book, The Poor Will Be Glad, by Peter Greer and Phil Smith, was about the benefits (and drawbacks) of microfinance among the world’s poor, which I decided to read before my husband did. By the time I gave the book back, my husband needed all of his speed-reading skills to finish it before the meeting. This was not because I read slowly, but because I kept stopping to think and to reorganize my view of who the poor are and what they really need from me. One wintry day I walk into a clothing store and see a display of thick, warm jackets. I devise a generous plan to buy some and distribute them among the needy in some cold corner of the developing world. I feel cheerful and inspired as I negotiate a bulk discount with the store manager and go about making the various arrangements for transporting 300 jackets across the world. I find a poverty-stricken slum and fly there with my useful items. I hire a translator and set myself up in a corner of a common meeting place, handing out a completely free jacket to whoever looks cold or needy. 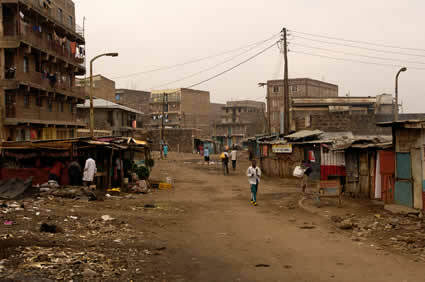 A poverty-stricken neighborhood in Kenya. There is soon quite a crowd and when all my gifts are distributed, I look around at the laughing faces and get a warm, fuzzy feeling. These jackets were even better to give than to receive. I pack up and head for home. The only people I now see are those wearing new warm jackets; I don’t notice the grim-faced woman staring at me from inside a rickety stall. She was there with her little make-shift shop before I arrived and she is still there, but I hadn’t bothered to think about what she was doing because she already wore a warm jacket and therefore needed none of my help. Her warm top is actually very similar to those on the table in front of her — handmade, simply designed, not as detailed and innovative as my generous gifts. Her half-dozen items of clothing hardly cover enough of her stall to make it easily identifiable as a shop. As I pass out of sight, dancing children following in my wake, the woman, whom we will call Sue, begins to slowly pack up her wares. It is too cold today to sit here any longer, now that the four women she knew to have been saving for a purchase from her are busy showing off their new jackets of far better quality to their friends. Sue walks home slowly, thinking about her children and how she will afford the rent this month. There is only one real option — she must sell her warm jackets at a cheaper rate, make up the rest of the money by selling her business’ equipment as well, and find some other job. She knows this will mean no warm jackets to sell next year, but having a business next winter is of no use if you and your family starve in the meantime. I return home to accolades for my thoughtfulness. Is it likely that the existence of Sue would be imagined by anyone around me or that I would be asked to really consider my impact on the economy of those I had gone to help? How many of us would think about what might happen to the price of warm jackets next winter in this cold slum, since half of those engaged in the trade had closed up shop? How many other cold people can now no longer afford warm clothing at all? Now let’s imagine this differently. I walk into the clothing store one wintry day, see the warm jackets, and think about giving them to the poor. But instead of focusing so fully on what I can do for poor people, I leave the shop thinking about who poor people are. I go home and do my research, find a frozen slum and decide to fly there. I arrive empty-handed in the meeting place, my translator by my side. I have a completely different attitude — one of learning, asking questions. I have no large boxes of goods to move around, which gives me time to sit down and talk to a woman with a rickety stall. I talk to Sue about the challenges and opportunities of manufacturing warm clothing in such a place and find that her greatest limitation is the high cost of getting her fabric and threads from a supplier in a distant city. A visit to a local church gives me the names of some local Christian businessmen whom I sit down to talk and pray with, forming and refining plans. At length a plan is created, and I set about putting it in motion. Returning to the woman in her stall, I find that Sue has sold four of her warm tops to some local women who had been saving up to purchase them. I purchase her remaining stock and give it to the local pastor for distribution among those in his community he knows to be unable to purchase such items themselves. I then visit a number of other small garment-making businesses in the area. The common theme is one of high shipping costs for materials from their suppliers. I return to the group of businessmen and use their local knowledge and business contacts to locate a reliable supplier of the various items needed by the clothing makers. I negotiate a discount for bulk and ongoing orders, and arrange the most economical bulk shipping for the goods. A local man known for his honesty, currently unemployed, is selected to be in charge of the new local depot for fabrics and haberdashery. I put the word out among the local women, and a crowd of them soon appear to check out the goods and prices. They find that my discount for bulk purchases and shipping has allowed me to put a reasonable mark-up on the goods and still charge a price that is significantly less than they were previously paying, when their shipping costs were added on. Sue pulls out the money she has made from her day’s sales. All of her six warm jackets were sold at their full price, so there is quite a pile of coins in her hand. She smiles as she counts out the money needed for this month’s rent and returns it to her pocket. There are extra coins still in her hand, which she spends on things from the new shop before her. Sue walks home quickly. 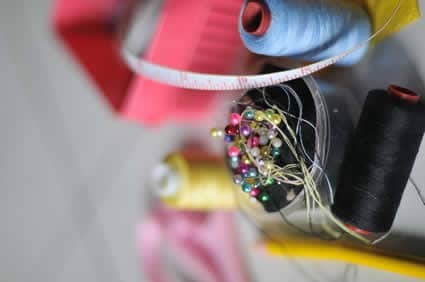 She has a lot of work to do, hand-sewing her new materials into more warm garments for sale next week. She has been able to afford more fabric than normal, so her store will be better-stocked and probably attract more attention. The new fabric and haberdashery depot begins to make money as more and more women come to rely on it for their materials. Another salesperson is hired, and eventually the thriving business is made over to the ownership of the man who was its first manager. 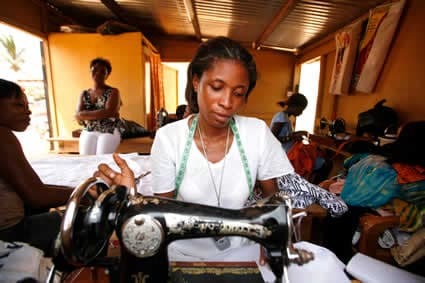 The profits are used to buy a proper cutting table for measuring out the fabrics and a sewing machine for Sue, which cuts in half the time she needs to spend making each garment. A Ghanian woman sewing in her shop. By next winter there are new clothing businesses, which are making cheaper garments for those who cannot afford the warmer, better quality jackets sold by Sue and her competitors. It is almost always true that a hand up is better than a hand out. I found the more I thought about it, the more my view of charity was challenged. Is the thing I am giving better to give than to receive? Is the gift you are contemplating simply something you want to give, or is it doing real and lasting good in the community you are hoping to help? I took a closer look Compassion’s work, this time with fresher eyes, and was cheered. Compassion’s policy of exclusively partnering with local churches gives them vital local knowledge and keeps their work culturally appropriate. The one-on-one approach prevents the work from becoming too standardized to meet individual needs. All the locally purchased gifts help the local economies. And the focus on education and encouragement reduces the risk of dependence on Western support. I do not think I will ever look at giving the same way again, and I was glad to find myself more pleased than ever with Compassion’s work. 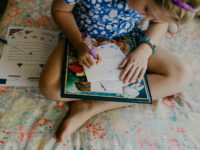 I found that I was profoundly thankful for the rules that had prevented me from ignorantly sending well-intentioned gifts to my sponsored children through the post. Poverty is complicated enough already. ABOUT THE AUTHOR: Mez Lyndon has been a Compassion supporter for close to 10 years. She and her husband, Josh, live in Brisbane, Australia, with their cat Maya, and they sponsor four children. If you’re interested in writing a guest blog post, we are happy to consider publishing it. Read our guest blog post guidelines. How Does Giving a Gift Help People in Poverty? Prev Post:An Improved Way to Write Your Sponsored ChildNext Post:How Deep Does Compassion Run in Your Family? Please keep this page up! I am continuing to refer people to it! 🙂 God bless you! This is just one of many things that makes Compassion such a wonderful move of God. They have gone about reaching the poor in the correct manner, by touching on all the needs of the local communities. Great blog! An addiotional point to think about in the first scenario is that those jackets purchased in ‘your local clothing store’ may have been produced overseas in conditions that do little to benefit the workers who made them and can be doing harm . 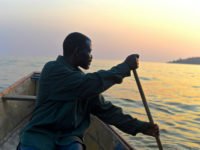 As well as micro-finance schemes in developing countries we should think about ethical buying ourselves – looking for the fair trade label when we shop so that we can be sure the workers who made the garment (or food or whatever) were paid a fair price and not forced to work in appalling conditions for little or no pay. This is why, when you send a child, family or project gift, it’s best to send it without instructions. Then the local Compassion staff member and the family can choose the most appropriate way to spend the money and it helps the local economy. A few years ago I sent a family gift to my Manuel and they bought I bright blue front door for their house. This is something I take for granted in my home and would never, ever have thought of giving as a gift, but they needed it. If I’d known they didn’t have a front door (single mum & 3 kids) I would have sent the money sooner. Thanks for the book reference…it is now on my must read. This is fantastic. I love the two different scenarios you laid out – definitely something we can all relate to and therefore understand better. This was really insightful and the book you mentioned sounds interesting. This is amazing! I would like to link to it from my permanent site, because THIS is how, someday, (in GOD’S timing) I want to use Christian radio to make LASTING and truly HELPFUL things happen in places of need! To GOD be the GLORY! Hallelujah!! Oh, my. This is excellent. You did a fabulous job of laying it all out for us to easily comprehend the difference between the two types of giving. I am so impressed with your article, Mez. Even though I’ve always believed a hand up is better than a hand out, I want to thank you for providing several angles I had never before considered when it comes to giving to those in poverty. It is indeed very complicated, but I too am grateful for the way Compassion sees to it that the “birthday gift” I just sent is money which supports THEIR local economy, not mine. You have given me much to think about. Thank you for this insightful blog! You are so right, I absolutely agree with you about poverty. And this book you have told about in the beginning, I find it very interesting! Support children as they wait for their own sponsor. Why Help People in Poverty in Other Countries When People Need Help Here? I Am One Life 3So inspiring! I'm praying for a chance to do something like that! How Does Compassion Prevent Child Departures? 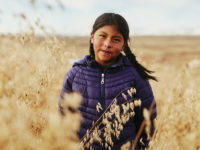 © 2019 Compassion International. Compassion and Compassion International are registered trademarks in the U.S. Patent and Trademark Office. All Rights Reserved.